On.Live is up and running and we have had our first tenderers on the platform. You can now focus, for example, on caring of yourself by taking private session with a fitness trainer, get advice on nutrition with the help of a dietician with 25 years experience or order a private pianist for your romantic dinner. All this thanks to the live streamed two-way video connections On.Live provides. With On.Live not only you can find the service you are looking for, but also become a supplier yourself, taking advantage of the platform’s potential and earn money sharing your knowledge and expertise with others. On.Live is really a platform for everyone. It’s built by people for other people. It is a live streaming services marketplace for all. It’s very important to note that On.Live is not a subscription service like many others on the internet. There’s no fee for setting up an account. On.Live will remain free-to-enter and browse. However, like on a real market, the products — in our case live streamed services — are priced by the sellers. Everyone on the platform can become one and place his own offers in our system. To unleash the full potential of the platform and use all available features new users should sign in and create their own account. The process is very straightforward and takes no longer than 5 minutes. Logged in users can buy or sell services on the platform with ease. If you wish to place your offer and share your knowledge using On.Live you should know some basic concepts and principles of the platform’s operation. On.Live operates a little differently than platforms you probably already know. 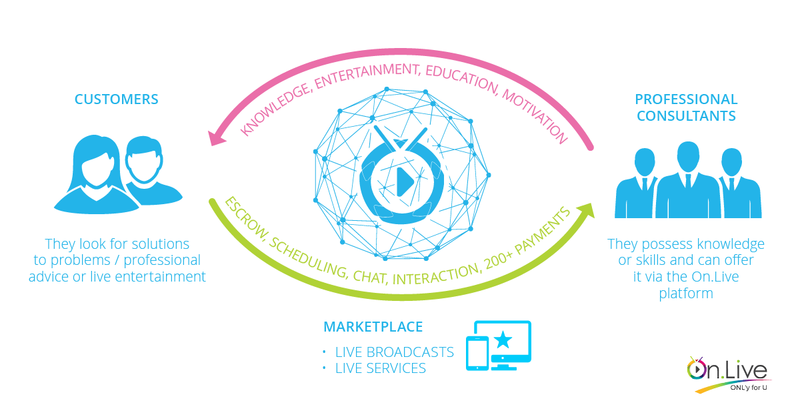 These differences are the result of teh business model and the principles of operation of our live streaming marketplace. There are some basic concepts and working principles. Understanding them will help you move around and utilize the full potential of the platform. · The Channel is the basic functionality in On.Live and may be treated as a counterpart to the user profile. There is slight difference as the Channel is not automatically tied to user login credentials. Unlike other platforms in On.Live any given user can create multiple Channels, and each one with multiple live video offers. · Offers are contained within the channels. They represent the core functionality of the platform. With offers you can present and describe what topics you will bring up, what you specialize in and how you can fulfill the needs of your customers. · The Calendar is essential in planning live sessions with customers. As a service provider the only thing you have to do is to set your availability. Your clients can then book sessions with you in your working hours. You will receive notification of booking in the system and via the email you have provided when creating your account. · The Wallet is where you receive payments for your live sessions in ONL tokens. These are converted into a selected fiat currency during the withdrawal process. You can transfer your earnings to your bank account at any moment. Both service providers and regular users can deposit and withdraw their funds. · Chat and instant payments allows you to contact anyone on the platform prior and during the session. With chat you can present details of your offer to your potential clients, reschedule sessions, send files etc. Chat also has the function of instant fund transfer, so regular customers can transfer ONL as a tip for a streamer. It may come in handy in certain type of broadcasts or services, like for example gameplay streams. These few pointers should be enough to get you going on On.Live and start using its potential. Of course there are many more functions and options on the platform and you shouldn’t be afraid of checking out how they work yourself. You can always use the On.Live help system, with step-by-step tutorials covering all aspects of user interface. We are constantly building up this section, adding new topics and new how-to articles. If you know people who would be interested in our platform, join our referral programme at: https://on.live/site/friends, and share this information with them. 👉 Get On.Live and start earning with your knowledge. 👉 https://On.Live Find something interesting for yourself. Evolve your skills with On.Live. 👉 https://on.live/site/start Create your own Channel. Share your knowledge with others. 👉 https://on.live/site/friends Join our affiliate programme and gain additional benefits while using On.Live.